Or is it a disadvantage to move first? I know that you specifically asked about 8x8, but I just want to add that it seems that most solved sizes (with a height more than 2) has player 2 winning. where can I find detailed data on that? @Ingo #1: I recall a similar discussion in the past but I can’t seem to find it in the forum now. But I remember Ray saying that on 8x8 he believes that the first player has an advantage. @Thnikkaman, Ingo #2: “I” report a win for Black on 5x5. Not sure if 6x6 is within my grasp. I have put oracles in java for 3x7 and 5x5 here. @hallabda: Do you still feel that theory points to a second player win in 8x8? I agree that it is hard to ignore all those other results! I don’t really know about theory. But as a player I’m still inclined to believe that 8x8 is a second player win (which doesn’t even mean that I have a higher success rate as Black than as White). One quick follow-up on my “not sure if 6x6 is within reach” comment. After a few tests I think it’s fairly clear that Wanderer is not even close to having anything to say about the status of 6x6. In the generalized version, do you always start with pawns on your two back rows ? possible first-player advantage in Breakthrough. similar game on small boards. 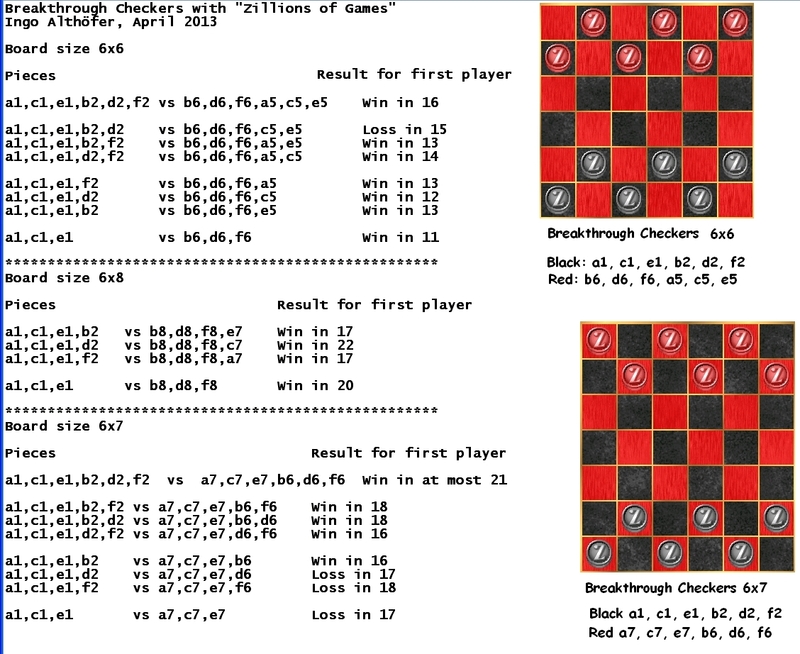 I took "Checkers"
3 or 4 or 5 or 6 pieces for each player. has better chances to win. Looking at the most recent stats on igGameCenter, Breakthrough has an incredibly small difference between first- and second-player wins. As of this post, it is 532 wins 1st player, 530 wins 2nd player. Does anyone have any more stats on this game? It would be interesting to know the ‘real’ first player win percentage. To get that you should only count games where players are more or less equal in strength. If you count each game, including big rating differences, loss on time etc. then those numbers don’t say much. About Ingo’s analyzis: It’s interesting, but imho it’s a different game, you can’t compare the results to breakthrough. I disagree that “those numbers don't say much”. Games where players aren’t equal in strength would just dilute the data, not skew it. Sorry for presentation, I hate textile pseudo-implementation with no |table| nor pre.. code. The ratios for Ray of wins as white and as black are respectively of 90.13% and 89.16% ! “when Ray starts as White, he wins...” and then “... when Ray is black, first player (White) wins 53 games...”. I recently ran a self-test with Wanderer. Playing 500 games at 10 secs per move White won 262 games, = 52.4%. My statistics are rusty, but neither the difference between 105/134 and 100/134 nor between 262/500 and 1/2 looks significant. Could someone whose confidence is greater than mine estimate the confidence with which we can say they’re different? Any real statistician out here? I have wondered if this position is a zugzwang. In the first game, white tries c1-b2 but it fails. In the other b1-b2 fails. White trading off does not help, because it gives black an extra piece further forward. So, my conclusion is that if you are black, trying to achieve this position seems to work. is a race and therefore a win for White. To be even more caricatural. Let’s include the moves 41.h1-g2 42.g5-g4, so the position is symmetrical. Now 43.b3-a4 is definitely a race. White wants to exchange on c6, play a4-b5, reach the sixth rank with that pawn and make a winning pawn sacrifice in the center to obtain a second pawn in the sixth rank. - White wins on move 45 otherwise. Indeed the only other way (in addition to the destabilized wall) for White to prevent the straight wall (without exchanges) is to get the “missing tooth in the center” position which is also a win for White. And we “know” that exchanging in the enemy’s camp is bad. Thanks for bumping this interesting threat, how long do you think we need before getting the answer? Will breakthrough be dead then? 46.c6xd5 is a win for Black. Taking symmetry and transpositions into account, table-basing the simplified game I defined, should be already possible. black, played in a way which, if continued, 45. c4xd5 move .... wins. this game is incorrect, when the white moves on to lose, I want to say. So, please continue after 46.c6xd5. We are not talking of the game, we are talking about this position in general. I think we are not properly understanding gardiyan. I suspect he is using an automatic translator that could probably use a little work. E.g., “pomegranate”?! The point of my refutation is that on 43.a4-a5 (which is a better try) 44.b4-b3! 45.a5-b6 46.a6-a5!! 47.c4-c5 48.f8-e7 and Black wins. It is crucial not to move the a6 pawn until the White pawn gets to b6, and blocks the second White pawn on c5. Since I am basically alone in trying to galvanize the breakthrough forum, I assume that few are interested in such things. Maybe I am wrong. Halladba, your recent connection, though you have 0 ongoing game, was that to read the forum, or are you checking if the championship finally starts. Do not tell me you get off the championship! “You may say I'm a breakthrough theorist, but [hopefully] I'm not the only one.” Am I? I don’t consider myself a Breakthrough theorist, but I like working with Wanderer to try to answer some of these questions and better understand the game. Wanderer doesn’t like Gardiyan’s sacrifice but rather thinks that earlier white should shift to the other side of the board with 37. g3-g4 where he simply follows 38. g7-g6 with 39. h1-g2 and thinks he is doing fine. Is he not seeing trouble on the other side of the board? At the time of Gardiyan/Basat’s sacrifice, it is already too late. I will play a5-b4 anyway with the same consequences (the extra white pawn in b3 will not help). Instead of 40.g7-h6, the same plan with b6-a5-b4 should also win. (35.b3-b4)...white high chance of winning is the way to continue. Interesting! So it seems you were already lost after 35. b3-a4. In which case: (1) Can you really survive after 35. b3-b4? (early experiments look promising for White) but if not, (2) How far back do we have to go to find a saving move for White?! After 35.b3-b4 36.b7-a6 37.c2-b3 38.a6-b5 and Black wins. It soon reaches the known zugzwang position. I am interested in the results, but am not strong enough or devoted enough to contribute meaningfully. From experimenting with my program Luffy, it seems that it plays stronger with white. Since the opening seems to resolve around the control of center squares on lines 4 and 5, it would seem logical that playing first is an advantage. white development is advantages. but white more encounters with the zugzwang position. I think the game is a second player win with optimal play reaching zugzwang. Does anyone know some breakthrough dimensions where player 1 wins but not in 1 move? My last encounter with wanderer helped me relativize the ease that Black might have to force the Black Hadrian’s wall. Are 42.h6-g5 and 42.a6-b5 both winning for Black? Convinced that I was totally winning, I rushed and played 42.a6-b5? thinking that I was about to attend computer’s standard desperation moves. I was immediately punished: 43.c4xb5! 44.c6xb5 45.c3-c4!! Although Black seems a tempo ahead in the queenside, the extra defensive pawn in d2 which protects the c3 square is decisive. Compare the useless pawn in h6 to the pawn in d2. The conclusion seems to be that the attempt to keep a central defensive pawn does not quite work. What about other attempts to thwart the Black’s Hadrian wall? Is 39.g4-g5 a real danger for Black? Rather than risk jumping to conclusions, would you kindly adjust the coordinates on your sample variation? I’d like to see what Wanderer thinks about it all. Thanks!